She Paints Her Nail Silver, And Adds Red. When She's Done? This Is The Coolest French Mani! If you are looking for a quick and easy design to slap on your nails for this year's Valentine's Day celebrations, this unique spin on a classic french mani definitely fits the bill. You don't need any fancy tools or techniques to put this look together, and it can work with any color palette you want to use! A nail design that's fast, simple, and flexible? Sounds good to me! Before you apply any kind of polish to your nail, you want to use a cleanser to remove oil and residue. This will help your manicure last longer! Next, to protect your natural nails, and to give the polish you're going to be using something to hold on to, apply a layer of base coat. Use the silver polish as a base color, and apply two coats. Allow each layer to dry before applying more polish. This next step requires a steady hand, so take your time! 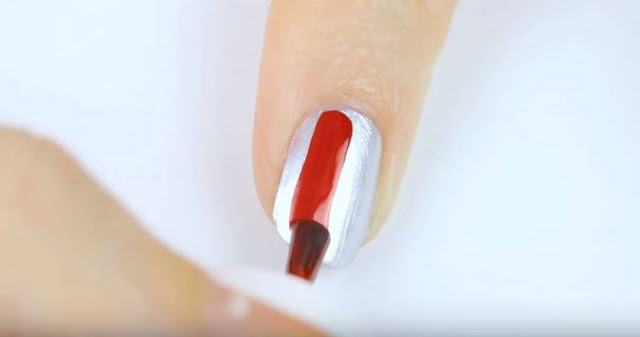 Starting at the base of your nail, take the red polish and slowly pull the brush up, maintaining a straight line and then curving out just as you reach the top. You want this line to be a few millimeters away from the side of your nail. This untouched silver strip will be the sideways "tip" of your french manicure. Fill in the rest of the nail with two coats of red polish, allowing each of them to dry completely. Complete the look with a clear top coat, which will smooth out the design and give it a shiny, protective finish! Remember, even though we've chosen to gear this tutorial towards Valentine's Day, you can easily change up the color scheme to suit whatever occasion or look you desire! To see the full tutorial, check out the video below!